The idea is certainly appealing. 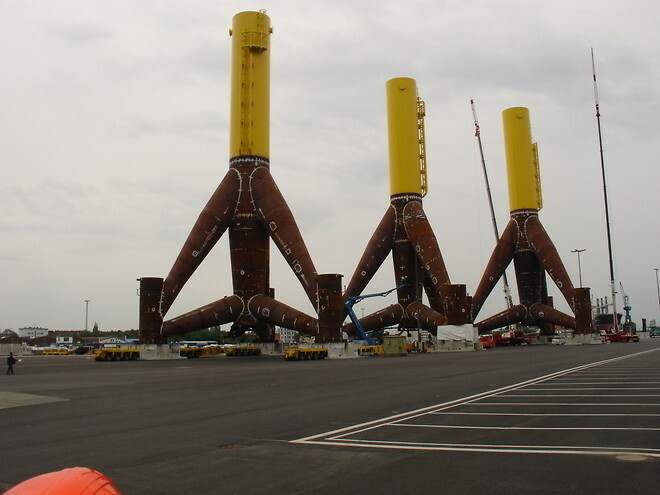 Instead of installing offshore wind turbines on huge, complex and expensive tripods, simple steel cylinders could be used in the future. These foundations are called monopiles - and they are far cheaper than jacket or tripod foundations. But why have turbine manufacturers only just come up with this apparently obvious idea? The answer lies in drilling technology. So far, it has only been possible to drive monopiles to a depth that allows them to support turbines with a power of two or three megawatts (MW) at most. Sheet steel is bent and soldered to make the large cylinders, which are then held by a claw from a ship or hoisting platform and driven into the seabed with great force using hydraulic or diesel piling hammers. The latter are heavy steel constructions that hang from a crane and lift heavy weights by igniting a compound of diesel and air. When the weight falls down again, it hits the monopile, thus driving it a little further into the seabed each time. However, diesel piling hammers can only cope with foundations that have a diameter of up to six metres. Too much power is needed for anything bigger than this. But larger turbines need foundations with a larger diameter. Another problem is the volume of sound produced when metal hits metal. As noise carries a long distance underwater, marine fauna may suffer permanent damage. As a result, the authorities have set a noise limit of 160 decibels at a distance of 750 metres from the building site. But even this limit can prove tricky when the monopiles are rammed into the seabed. There is also another issue: monopiles cannot be hammered into complex geographical structures, such as a stony substratum. Christoph Budach from Essenbased building concern Hochtief Solutions describes these problems as "the three big disadvantages of ramming". His solution for the three-part problem has three letters: OFD, which stands for offshore foundation drilling. Instead of using enormous force to hammer the foundations into the seabed, holes are drilled for them. Hochtief, which is one of the largest construction companies in the world, and Herrenknecht, the global market leader in tunnelling equipment, joined forces on OFD and set up a research consortium. "Herrenknecht was looking for new markets at the same time that we at Hochtief realised we would need to use a drilling technology offshore in order to install large foundations. That was two-and-a-half years ago," Budach recalls. The two companies have been developing the drilling equipment and the necessary logistics for offshore projects together since then.